• Keep Calhoun-Gordon Beautiful is established through the hard work of locals interested in creating a more sustainable community. "We're running out of landfill space. At which point do you contaminate all of the ground?" Calhoun Middle School teacher Donny Robertson asked. "At what point do we say enough's enough?" Robertson, who teaches an elective called "Going Green" among other science courses, is involved in establishing a Calhoun-Gordon County affiliate of Keep America/Georgia Beautiful. Along with other locals, he's been working on raising awareness, changing the mindset of the local community towards sustainability and beautification. And he's also the new club's president. "I was asked if I was willing to be the president, and sure I'm willing but I'm just going to do what I have to do," Robertson said, adding that he doesn't want to sit on the sidelines. "There's a need to get things off the ground and going." As someone who's become tired of finding and picking up excess litter on his street, Robertson wants to make a change. And he personally believes that recycling and keeping the community beautiful has nothing to do with politics, though he's had some call him a "left-winged liberal." According to him, doing the right thing shouldn't be restrained to political parties. "I couldn't care less if you're a Democrat or a Republican or whatever," he said. "If it's the right thing to do, it's the right thing to do. (Recycling) shouldn't be tied to politics at all whatsoever." Currently, the KCGB president is educating his middle school students on the importance of recycling, diverting waste away from landfills and how large scale changes start with small steps. To be officially affiliated with KAB/KGB, the Keep Calhoun-Gordon Beautiful group needs to host a certain amount of events that would encompass the three focus areas of litter reduction, recycling and beautification. And in addition to Robertson, others who are involved with the KCGB include Halstead International's Sustainability Specialist Jordan Stone (who serves as the group's vice-president), Amanda Tate, Angie Gravitt, Amber Nagle, Jane and Ed Weldon and Calhoun's City Recycling Coordinator Judy Peterson. Peterson, who has been working with local businesses and the city's Recycling Center for around four years, is very excited about the KCGB becoming an established organization in the community. She is especially proud of the way the already formulated group includes members from all age groups, ranging from 20-year-olds to those in their 80s. "We've got beautiful crosses of people from all across the spectrum and I think that is lovely," Peterson said, including that she appreciates the different perspectives various age groups bring to the table. "We all have the same goals; we just view it a little differently." And in addition to creating a greener, healthier place to live through her association with KCGB, Peterson wants to also highlight local businesses doing good work in attempts to raise awareness. Both her and Robertson identified Halstead International and Mohawk Industries as two major leaders in Gordon County who are prioritizing recycling and waste reduction. "I don't know that we give businesses, small or large, enough credit for what they're doing," Peterson said. She commented that businesses such as Chick-fil-A, AdventHealth Gordon, Mannington Mills and Northwest Georgia Paving are making headway in being sustainable industries, focusing on recycling and sustainable production. And along with help from businesses, organizations, individuals and local nonprofits, the KCGB will be raising local awareness surrounding landfills, waste reduction, recycling and how to keep the Calhoun/Gordon County environment beautiful. Robertson said he wants to be a part of a group of servant leaders, which is what the KCGB is intended to be. Robertson, Peterson and others involved want to see the local community adapt a more positive mindset toward sustainability and environmental care. "We need to take care of what God's given us, that's my main thing," Robertson said. "Be a good steward. If you love this creation why wouldn't you want to take care of it?" As one of the KCGB's first official events, they will be co-hosting an Arbor Day celebration alongside the City of Calhoun, the Calhoun Woman's Club, Master Gardeners and Calhoun Elementary School's Rota Kids. At the event, the sponsors will be handing out free tree seedlings in order to raise awareness of the important role trees play in the environment. The Arbor Day tree distribution will be on March 2, at the UGA Extension Service's livestock pavilion, 1282 Ga. 53 Spur, from 9 a.m. until 1 p.m. Seedling species available will include eastern red cedar, bald cypress, dogwood, willow oak, red maple, Thuja, and wax myrtle. Seedlings will be distributed on a first-come, first-served basis. In addition, the KCGB will also be hosting a 2019 World Environment Day Golf Tournament on June 5 where proceeds will directly benefit the affiliation and help create a more beautiful, environmentally-friendly community. The KCGB is in the process of collecting registrations and sponsorships from local businesses, and Mohawk has partnered alongside the organization to sponsor the tournament. The tournament will be held at Fields Ferry Golf Course, 581 Fields Ferry Drive, starting at noon. For more information on either of these events or on the Calhoun Recycling Center, call Robertson at 706639-7556 or email Peterson at Peterson8336@gmail.com. Editor's note: The Calhoun Times' 2019 Review and Forecast edition, which will be published in March, will feature a mini-series on initiatives of local businesses that centralize around keeping Calhoun and Gordon County green, sustainable and beautiful. • Prior to grand opening, Bargain Hunt gives away two checks to express support of the Calhoun-Gordon County community. On Friday morning, complimentary Dunkin' Donuts coffee and doughtnuts were provided for the growing line of customers waiting for the new Bargain Hunt to officially open its doors. Yet, prior to opening, the Gordon County Chamber of Commerce performed a ceremonial ribbon cutting to welcome the new staff team, and Bargain Hunt staff in return offered a hand of support to the community. "We thank you for joining the Chamber, and if there's anything we can do for you, just let us know," said Chamber Chairman Paul Worley to the Bargain Hunt staff and others from the chamber who attended the ceremony. Those present included the Chamber's Ambassador Committee, Chamber President Kathy Johnson and Mayor Jimmy Palmer. "What Jeremy's done with these four buildings is really nice, it's a nice addition to our community and I'm sure the store's going to do really well," said Palmer in reference to Jeremy Rosenthall, the managing director at M & P Shopping Centers (the company that owns the shopping complex on W.C. Bryant Parkway). "We are certainly proud to have you here." As a part of the ribbon cutting ceremony, not only did the Chamber welcome the new staff team, but Bargain Hunt employees also offered something back to the community they were about to join. District Leader Dee Dee Quinones shared how the retail chain "loves to give back to the community" and that it was important to build connections. Quinones presented a representative from the Gordon County Boys & Girls Club and W.L. Swain Elementary School Principal Elizabeth Anderson each with a $500 check. W.L. Swain was chosen as the store's school partner following a contest among local students where they had to write an essay on why they love their school. One of W.L. Swain's fourth-graders, Seth Barnett, wrote that he rated his teachers "5/5 stars" and that he loved the good news club. "The specials teachers encourage us. How? They tell mini-stories to keep us going and learning our stuff," Barnett wrote in his essay. "They also help stop bullies from hurting us. They love us. We love them right back. That is why I love our school." Barnett was announced to be the winner of the essay contest, which resulted in him receiving a gift card to Bargain Hunt and W.L. Swain being chosen as the store's sponsor school, according to Senior Vice President Chris Chapin. "We have teachers come in a couple times a year and we give them a discount," Chapin said, explaining why choosing a school was important to the Calhoun location. "Partnering with a local school is something we started to do last year and will continue to do for years to come." • Specially-made bikes for 2 Calhoun children with special needs are presented to them and their families as a Valentine's Day present. Advance for Kids physical therapists, family members and friends of the two bike recipients - Zachary Cagle and Isabelle Funes - smile for the camera after both of the children get to spend time riding their new custom bikes from Freedom Concepts. Zachary Cagle, 10, who was just given a custom bike by Freedom Concepts, celebrates by riding around the parking lot at Advance for Kids. Advance for Kids's physical therapists help Zachary Cagle get adjusted in his new custom bike donated to his family by Freedom Concepts on Thursday. Isabella Funes, 6, gets adjusted in her new custom-made bike by Freedom Concepts Manager Jaydene Lowe, who presented the Funes family with the bike. 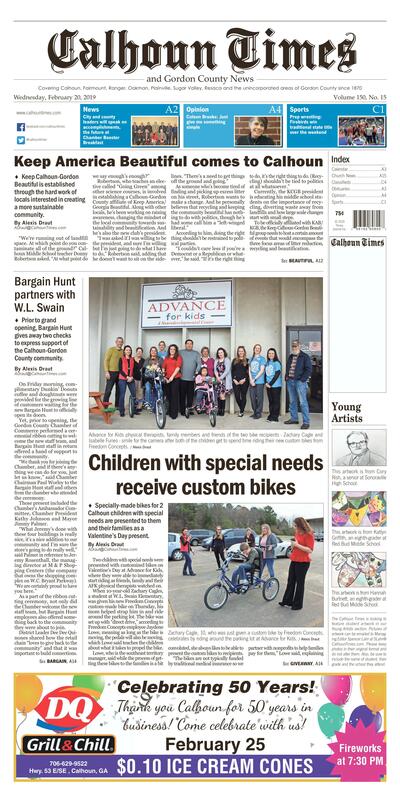 Two children with special needs were presented with customized bikes on Valentine's Day at Advance for Kids, where they were able to immediately start riding as friends, family and their AFK physical therapists watched on. When 10-year-old Zachary Cagles, a student at W.L. Swain Elementary, was given his new Freedom Concepts custom-made bike on Thursday, his mom helped strap him in and ride around the parking lot. The bike was set up with "direct drive," according to Freedom Concepts employee Jaydene Lowe, meaning as long as the bike is moving, the pedals will also be moving, which Lowe said teaches the children about what it takes to propel the bike. Lowe, who is the southeast territory manager, said while the process of getting these bikes to the families is a bit convoluted, she always likes to be able to present the custom bikes to recipients. Andrews links up with different nonprofits and hosts fundraisers to cover the cost of bikes and help families get what they need to allow their children to be independent, Lowe said. For the two bikes presented on Thursday, a lawyer's office in Atlanta donated money to Variety of Georgia, who then gave the money to Freedom Concepts to pay for the bikes. "We've partnered with some great charities and they don't make families jump through hoops and all that, it's very unique," said Lowe, who presents around 100 bikes a year for her specific region. "To be able to link the families with nonprofits we already partner with is great." Representatives from the Atlanta law firm, Attorney Niel Kopistky and Marketing Director Katie Schaff, were among those present on Thursday to see the two children receive their new bikes. Isabella Funes, 6, who was the second to receive a custom bike on Thursday, has wanted a bike for a while and even asked for one this past Christmas. In her new pink bike that matched her sweatshirt, Isabella was excited to ride around the AFK exercise room as her parents and AFK therapists watched on. "I can cry just because we've been waiting a while to give her something like this," Isabella's mother, Marie Funes, said. "She sees other kids riding bikes, so yes, I'm really excited. We are very blessed to be able to get this." Similar to the Funes family, Zachary's mother was glad her son could receive a bike specific to his needs, as the Cagles had been waiting for almost two years to receive funding for a bike. "At school, Barbara gets him on a bike and she sends me pictures, he really enjoys it," Zachary's mother, Bridget Cagle, said. "I'm so thankful for everyone who helped him get it. Without them, he wouldn't have been able to get a bike." Barbara Marvel, who works as a physical therapist for Gordon County Schools, Calhoun City Schools and Bartow County Schools, has been a pediatric therapist for the past 28 years. Marvel said over time, as the field has learned more about how each child is unique, education has become more individualized. "A lot of our forte is adaptive equipment, bath seats, wheelchairs ... you always have to look ahead," Marvel said. "It's everchanging and we never stop learning more and more about children and diagnoses and strategies to make them functional." Mai Lee Payne, the owner of AFK in both Rome and Calhoun, said these bikes — which are estimated to cost anywhere from $3,000-$5,000 — offer children a sense of independence and freedom. Payne said it's a therapist's job to understand the skills and strengths of their kids and identify the equipment needed to help them thrive. She said these bikes are helpful to get children active, moving and doing something different. As someone who has worked as a physical, occupational and speech-language therapist for the past 15 years since opening AFK's two locations, Payne said she finds a lot of joy in being able to see kids get their own bikes. "We know they're so capable of so much if they could just have the right equipment, the right situation and the right environment," Payne said. "That's our job as therapists, to make them as independent as possible and so when we can see that, it's a really big deal." This artwork is from Katlyn Griffith, an eighth-grader at Red Bud Middle School. This artwork is from Hannah Burtnett, an eighth-grader at Red Bud Middle School.